Spring Solstice? I’m not celebrating till the freezing winds stop where I live. No way has Persephone emerged in the Midwest yet! 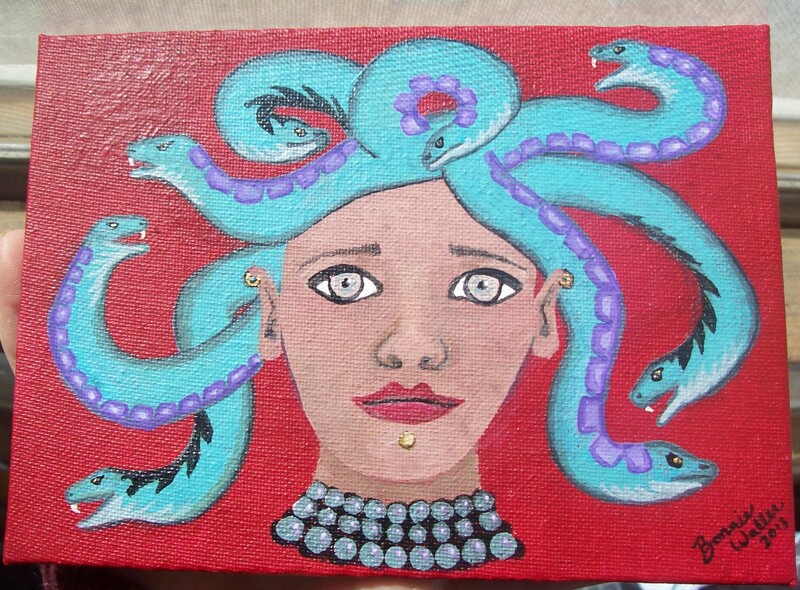 However, Medusa has been poking her lovely head into my dreams as of lately and so today I celebrated her in style by painting an original. To look upon Medusa’s stare can cause you to become stone. Exploring this psychologically, do I have some sense of inner rage still in me stemming from my adolescence (I painted her as a teen)? Am I daring to discover what the world says is forbidden? Am I angry at St. Patrick for driving all of the “snakes” out of Ireland? Or am I just kind of pissy that it’s still cold enough to snow? Either way, I feel that she brings power by releasing energy that has become pent up, bottled up, stagnated and stale. She is my fire and fang.